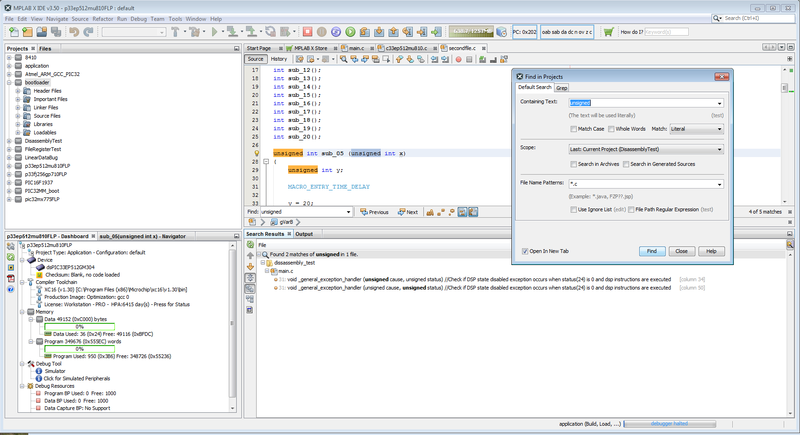 MPLAB® X IDE has a Find in Projects form to find text in the selected scope. 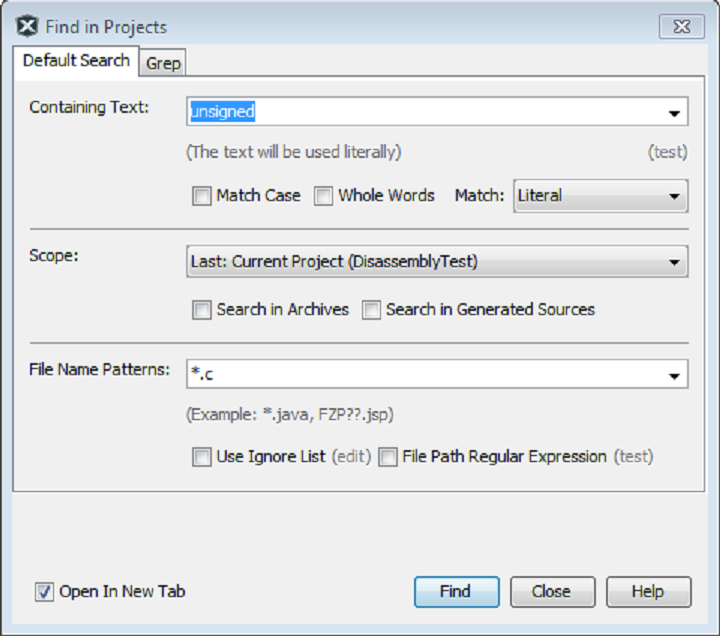 Find in Projects is selected from the main menu Edit ▸ Find in Projects…. The form will also display when the focus is in the Project window and menu Edit ▸ Find… is selected. The Search Results window toolbar button Modify Results will also display the form. The Default Search tab is currently recommended. Select the Containing Text from the combo box or type new search text. The search text will be stored for future searches. Options include Match Case and Whole Words. Literal: search for the exact string. Basic Wildcards: search with * = any string, ? = any character. Regular Expression: when selected, the (test) string is enabled for testing your RegEx pattern. Select the Scope for this search from the choices in the Scope combo box. Select the File Name Patterns from the combo box. Patterns added, like *.c or *.cpp, will be saved. An Ignore List of folders and paths can be created. File paths can be specified with Regular Expressions and a test utility. Open In New Tab: when checked, a separate tab is created for each search. Unchecked will overwrite previous results. Search Results are displayed in the Output area. Expand / Collapse all nodes in tree. Show results as folder tree. Show results as list of files. Show all details - list of results in Output view.